So you’ve do decide to stay-in on Valentine’s Eve (or you don’t give a damn about Valentine’s Day and you’re simply looking for a delicious dinner). Well, you’ve come to the right place. I’m serving up a scrumptious salmon recipe for you today, and let me tell you FIREWORKS IN THE MOUTH, folks. It is so good! Slow Roasted Salmon Cucumber Yogurt and Quick Preserved Lemons is the fare we’ll prepare. The recipe is linked to the wonderful food site The Amateur Gourmet, by Adam Roberts. But he got the dish here, from Suzanne Goin, and I recommend using her recipe as it is a little more detailed. I should also explain that I somehow happened upon this recipe on accident while I was looking for a recipe to make the most massive cheesecake I could find. Check. Check, check, check it out if you want to. Now on to our featured recipe! First up are the Quick Preserved Lemons. The reason this comes up now is that you will need to make these in the morning or at least by mid-day to have the pleasure of including them in your Cucumber Yogurt (and maybe some extra as a garnish, or to whip up a little post-dinner sorbet as one of my friends did)! 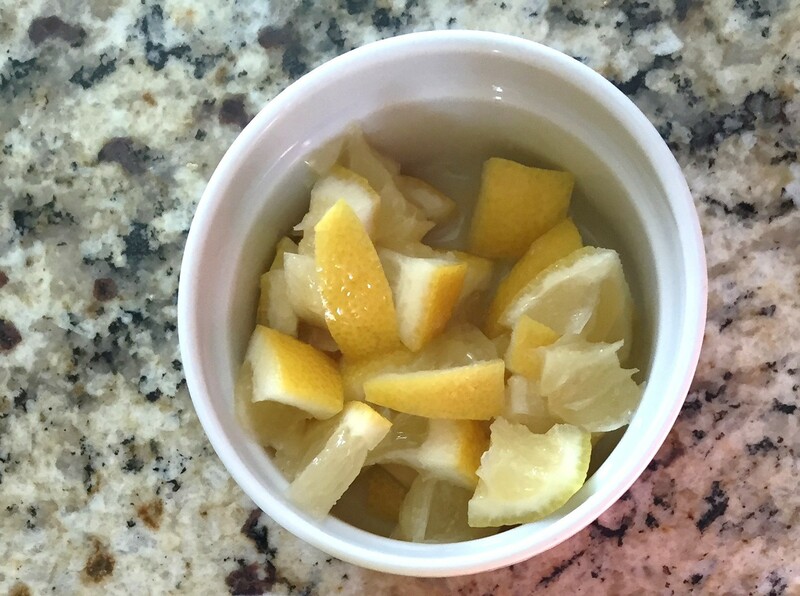 The recipe for these luscious lemons comes from Mark Bittman in the New York Times, here. Dice lemons, including peel, removing as many seeds as possible. 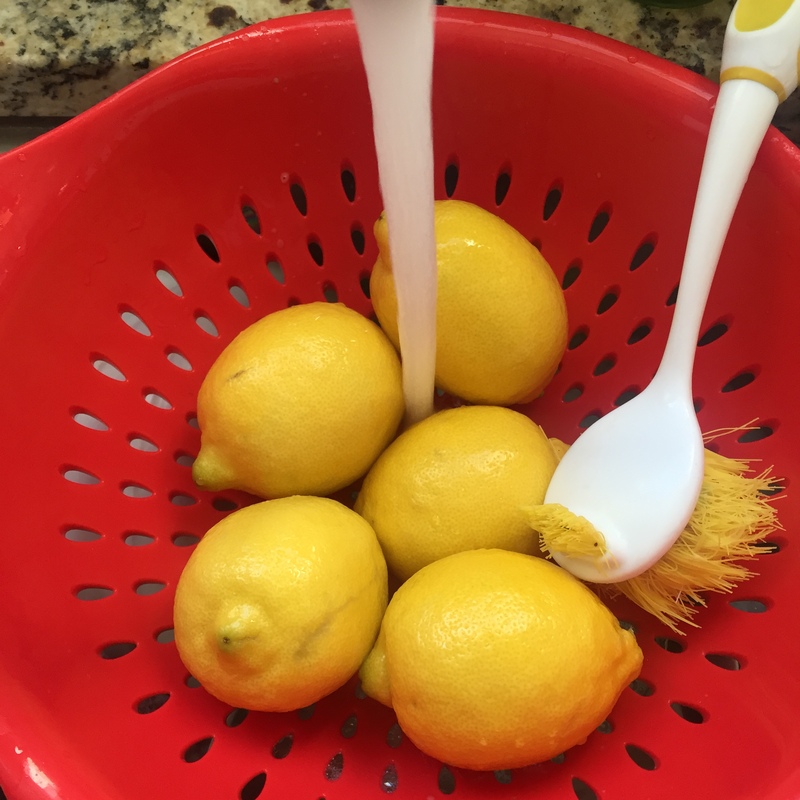 Put the lemons and their juice in a bowl and sprinkle with the salt and sugar; toss well and transfer to a jar. Let the mixture sit for at least 3 hours at room temperature, shaking the jar periodically. It can be served at that point or refrigerated for up to a week. Ta-da! Perfectly preserved lemons. Now for the salmon, and a link to the more detailed recipe can be found, here. This dish is almost (not quite) as simple as those lemons. Preheat your oven to 250 degrees. Make an herb paste with the lemon zest, shallots, dill, tarragon, parsley, and olive oil. Spread the paste on the salmon front and back and finish with salt and pepper both sides. 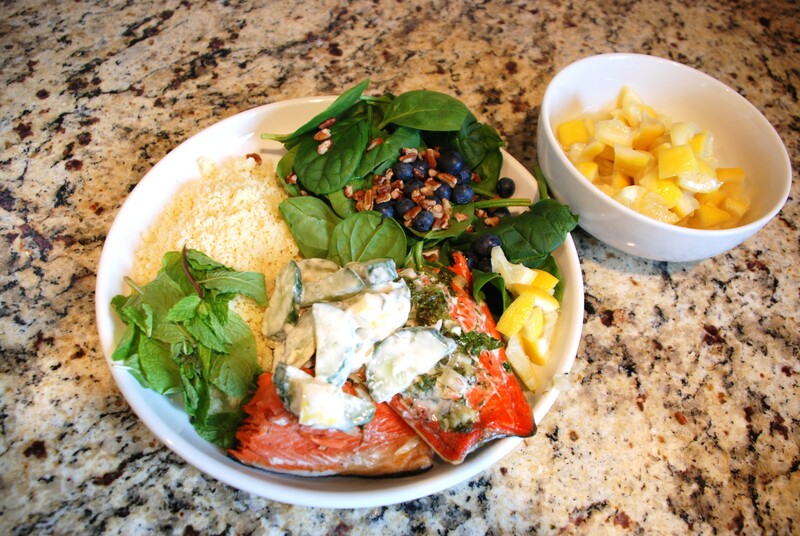 Place the salmon on a wire baking rack on top of a foil lined baking sheet. Roast salmon for 30 minutes until it begins to flake (the center may still be slightly translucent, you can check by peeking between the layers with a fork). If it doesn’t flake, it’s not ready yet. Add a minute or two to the bake time. Meanwhile, as the salmon roasts, you’re going to get your yogurt going. Slice the cucumbers in half lengthwise and then into small diagonal slivers. Mix the cucumbers the the whole milk yogurt, toasted cumin seeds, garlic, the preserved lemons, preserved lemon juice, cayenne, and mint. 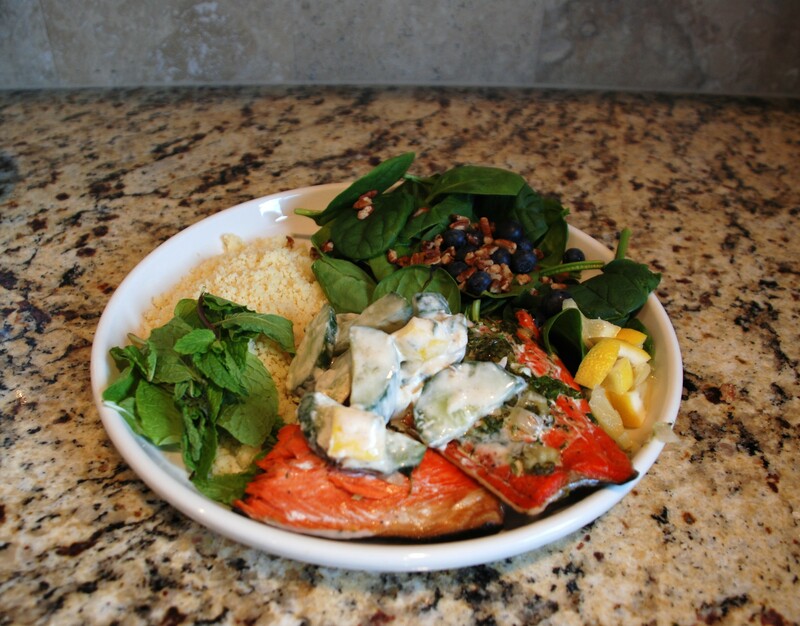 The salmon should be getting done just about now, so plate this dish like a pro. Place a portion of rice, quinoa, couscous, or other grain on the plate (honestly I used couscous because I had forgotten to make the rice and our guests were due to arrive in 10 minutes. Stress! But saved by this glorious, quick-cooking durum wheat). Top with a healthy portion of watercress. Now settle the salmon in alongside with a perfectly apportioned garnish of yogurt and you are GOLDEN! Light some candles and enjoy the flavor explosions on your tongue. Have a fantastic Valentine’s weekend! I never knew how easy preserved lemons could be. Excited to try! thanks! !